Nothing has earned a reputation for head-banging complexity among IT professionals more than ERP, but as enterprise-resource planning leader SAP tries to recast its image with the slogan "Run simple," there's no guarantee that customers will buy it. SAP hammered the simplicity mantra home in virtually every keynote, conversation and bit of signage at its annual Sapphire user conference last week. Still, the fact remains that enterprise platforms like SAP's are anything but simple, and neither are their customers. SAP sells to large, multifaceted enterprises, and implementations are a big deal, often requiring outside help. "Most organizations don't buy SAP because they have simple problems to solve," said Geoff Scott, CEO of the Americas' SAP Users' Group (ASUG). "You purchase it because you're a complex organization with complex business processes." "It is nice to see that SAP acknowledged that it hasn't always been a poster child for simplicity, and that clients have struggled in navigating the many offerings and resources available in this huge company," said Monique Hesseling, a partner with Strategy Meets Action. But it will take time and effort for SAP to overcome the perception that it's big, complicated, and sometimes difficult to work with, she added. She does see signs of progress, though, particularly in SAP's delivery to insurance clients, which are the focus of her firm. Maintenance and service tickets get escalated and dealt with significantly faster than in the past, she said. SAP also responds faster and more accurately to requests for proposals, and she has found greater openness and interest in understanding the customer within the company at all levels. 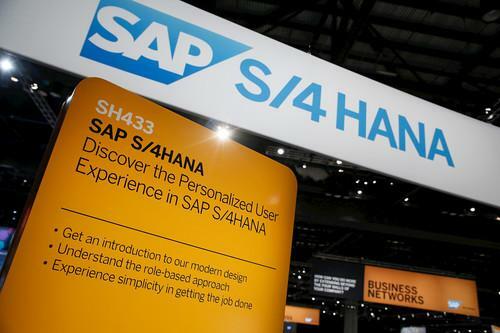 Some of the credit for the pared-down approach goes to SAP's new S4/Hana in-memory platform, which has simplified much of the technological foundation. By eliminating fixed database aggregates and redundancy, for example, the new system can reduce a company's data footprint by a factor of 10, SAP says. By performing both transactional and analytic processing in the same system, the technology promises throughput that's between three and seven times faster than the traditional SAP implementation. Analytics can be as much as 1,800 times faster. Overall, SAP cofounder and chairman Hasso Plattner said in a keynote at the conference, the goal is to enable the "boardroom of the future," where an entire corporation can be run from a smart watch or phone. Of course, none of this will amount to more than the proverbial "hill of beans" if customers don't buy into this new vision too. "From our perspective, we do agree with the concept of simplicity, but you have to remember that it's a journey," ASUG's Scott said. Simplifying the underlying technology is just part of what's needed to achieve the simplicity customers want, he added. "You've taken a 20TB database and compressed it to 10TB or 5TB -- I get that," he said. "But to us, simple is also about faster and easier configuration, getting people up to speed faster and getting changes into production super fast. "That's where I want to hold their proverbial feet to the fire," Scott said. "SAP, if you can deliver on that promise, wow." SAP needs to make software easier to buy and consume, with modernized deployment options, and it also needs to transform the services market so that software is faster to configure, without as much need for specialist consultants, agreed John Appleby, global head of SAP Hana at Bluefin Solutions. "S/4Hana is a big step in the right direction," Appleby said. "The user experience is modern and user-centric, the functional configuration is guided and therefore much faster, and deployment options are varied and meet the needs of modern businesses." Appleby believes that most customers would embrace the paradigms of S/4Hana if they could, but some may have found their decision delayed by business events or other IT operational issues. Steve Lucas, global president of the SAP Platform Solutions Group, acknowledges the challenges associated with promising simplicity in a highly complex technological landscape. "What we learned after 40 years of building apps is that the stack for building apps had become unreasonably complex," he said. The "run simple" message means "simple in how SAP solves problems for customers, how we build products and how we enable customers to reduce complexity in their own stack," Lucas added. "We want to be able to provide next-generation business applications so that you can run your business from your phone," he said. "That's simple; getting there is hard. But you don't have to do it all at once."